Peeling potatoes is one of those little kitchen chores that I should be totally cool with, but I actually hate. It’s fidgety, time-consuming, potato peels go everywhere, and little nicks and cuts are a threat. I know, settle down, Sam, it’s really not that big of a deal. You’re right, it really isn’t. 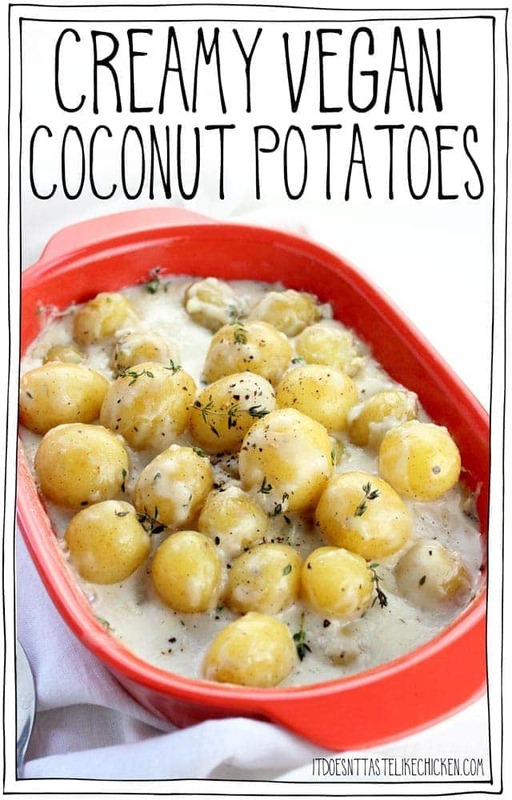 BUT if you are at all like me, you are going to love my latest potato discovery, my Creamy Vegan Coconut Potatoes. 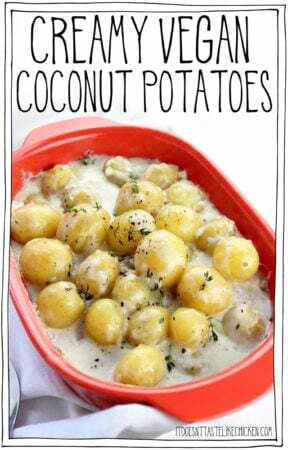 Creamy vegan coconut potatoes are like cheater scalloped potatoes. Yeah, you heard me right. The creamiest dreamiest baked potato dish, but unlike scalloped potatoes, they SO easy to make. No peeling, slicing, or cooking the sauce separately. Nope, these little dudes are a one and done type recipe. Just add coconut milk, a bit of flour, and seasoning straight into your casserole dish, mix it up, then add the potatoes, cover with foil and bake. THAT’S IT! I swear it really is that easy. The key here is using baby potatoes. 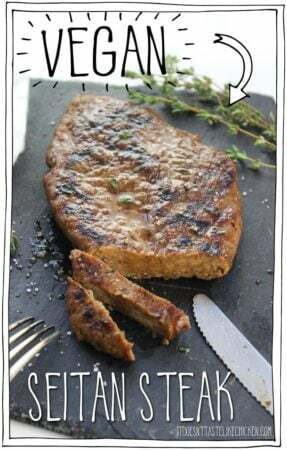 They are perfect for this dish as they often come prewashed, and you don’t need to peel or even chop them so they are good to go, no extra work involved. The potatoes will cook to a gorgeous buttery texture, and the coconut mixture will make a glorious thick creamy sauce for a dish that’s full of great flavour. The combo of coconut and thyme paired with the potatoes is so incredibly divine, it will taste like this dish took a lot more work than it actually did. It may look like a lot of sauce in the photo, but trust me, there won’t be a drop left. 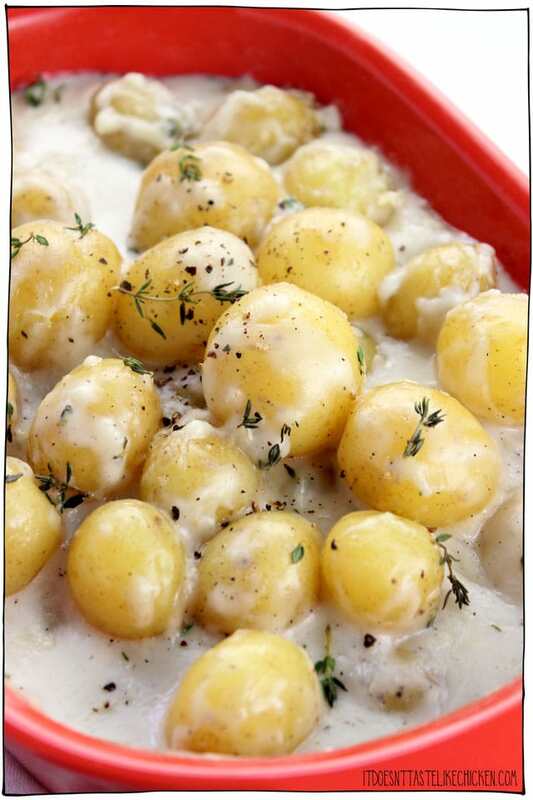 To make Creamy Vegan Coconut Potatoes: In a 1.5qt casserole dish (or larger), whisk together the coconut milk, flour, garlic, thyme, salt, pepper, and nutmeg. Add the potatoes and give it a stir to coat. 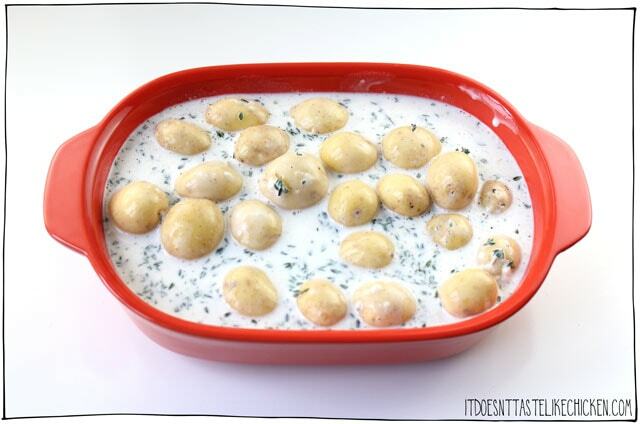 Cover with foil and bake for 50 to 65 minutes until the potatoes are fork tender. Serve hot and prepare for creamy deliciousness. Great served along with a salad and my vegan steaks, or crusted tofu. Omnomnom! 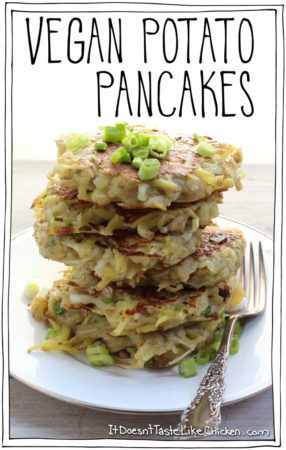 These are like cheater scalloped potatoes. 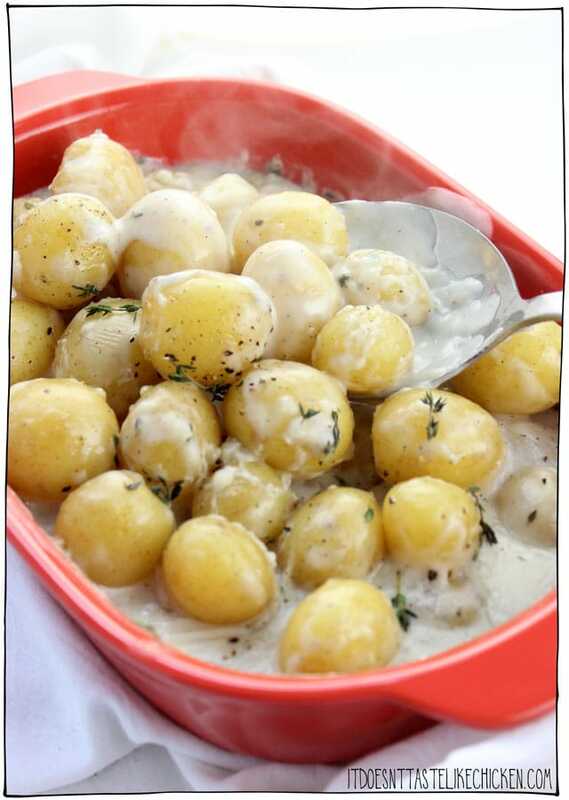 The creamiest dreamiest baked potato dish, but unlike scalloped potatoes, they SO easy to make. No peeling, slicing, or cooking the sauce separately. Preheat your oven to 400F (220C). 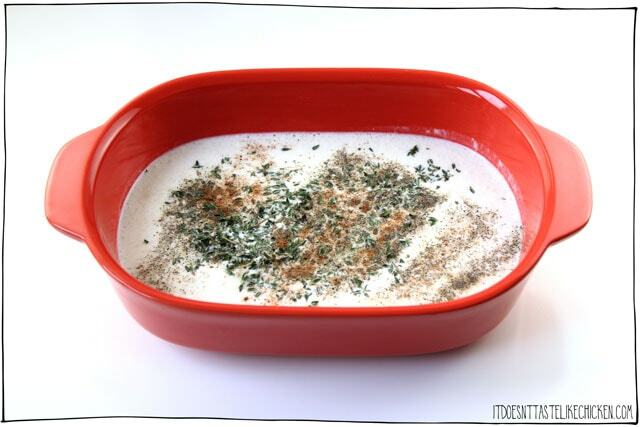 In a 1.5qt casserole dish (or larger), whisk together the coconut milk, flour, garlic, thyme, salt, pepper, and nutmeg. Add the potatoes and give it a stir to coat. 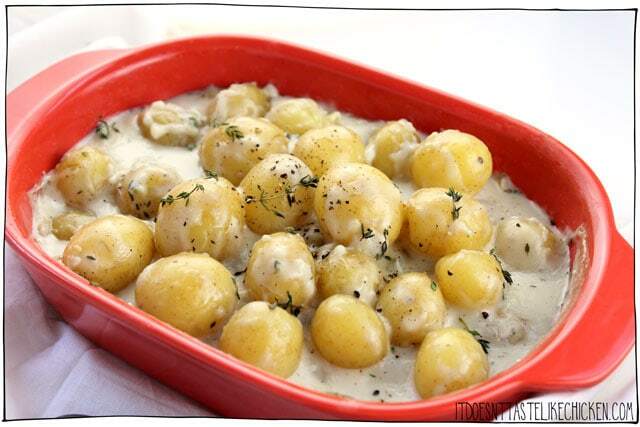 Cover with foil and bake for 50 to 65 minutes until the potatoes are fork tender. Serve hot. Beyond Awesome! Addictive. They were cooked in my toaster oven and I forgot to put the spices. About to do it again right now. Yum!!!!! Thanks for all your generousity!!! 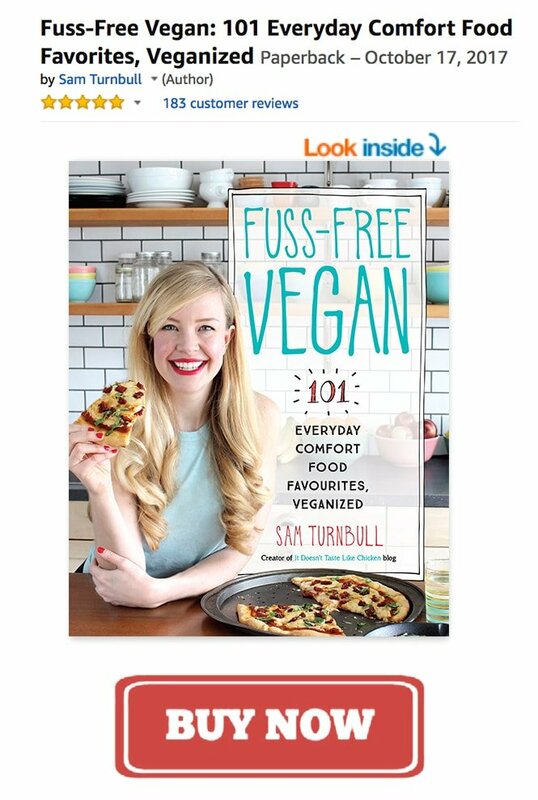 you have a very nice recipe…. I’d like to make these at a gathering where I will not have access to an oven. Would this work in a slow cooker? Thanks for all the great recipies!! I don’t have a slow cooker, so I’m not entirely sure, but my guess is that it would work fine. Enjoy! Oh my, these were very yummy!!! I reduced the recipe for the two us, so I used 2 medium-sized russet potatoes and cut them into 8 pieces each. They cooked nicely and easily in the 50 minutes. On our Thanksgiving table (our first one comprised completely of plants) they were the first to go! I will definitely be making these again. 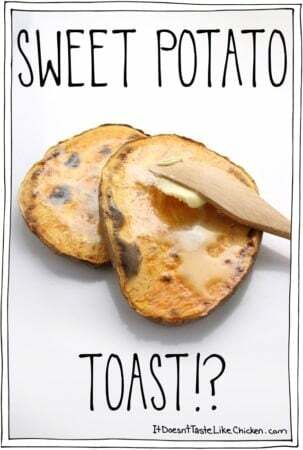 I’m going to try these for a potluck using the instantpot and doubling the recipe. I’m using one can of full-fat coconut milk and a can of coconut cream.I also plan to use dried thyme in the pot but add fresh thyme just before serving. They worked perfectly in the instant pot. 8 minutes and a quick release. Could you make these in the Crock-Pot? I don’t have a crockpot, so I’m not sure, but you are welcome to try! This is magic! 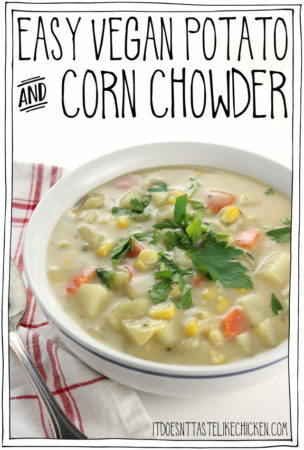 My toddler and I just made this for lunch and it was super easy and mouth watering delicious. I did these the other day. They were easy and delicious! I think I will put in onions next time. Just making them now – quartering the nugget potatoes, and I used brown rice flour. 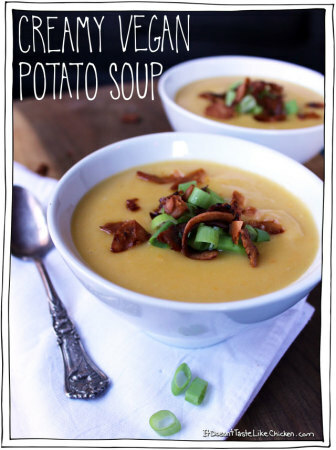 This looks so good and I can envision spinoffs with the addition of onions or shallots. Great to have another presentation for nugget potatoes! Thanks Sam! It is basic, easy, nutritious and delicious! You can’t lose with this one! O-M-SAM!!!! These are amazing!!! Amazing! So simple and the entire pot was devoured in no time. I used small-ish potatoes and cut into quarters, and had a little bit of “cheez” shreds in the fridge that I added at the last 5 minutes of baking. So delicious. This recipe is coming onto our regular rotation for sure. Thanks Sam!!! I made these tonight and they were a hit! I forgot to buy fresh thyme, but I had parsley and scallions from the garden and used a generous amount. My baby yellow potatoes were a bit big, so I quartered them (did not peel) and I think I liked that even better because they could soak up more sauce. Delicious. Good luck with the contests! 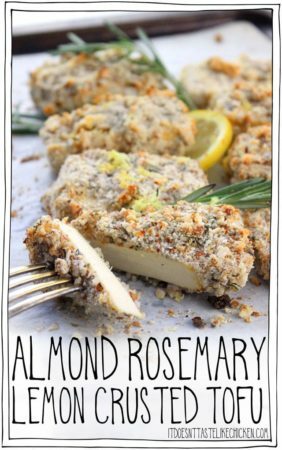 This may seem like an obvious question but can I substitute almond flour? Thanks, Laura! Yes, almond flour should work well. Enjoy! Good Luck and these look great, can’t wait to try this. Ooh. I’ll try this asap. Thinking the sauce ingredients will work for my creamed onions, shallots and leeks for Thanksgiving (US ) too. I’ll let you know. Oh I bet that would be yummy too! These are intriguing…will they have a coconut flavor from the milk? Not a strong coconut flavor, just a hint in the ones I made. They were fabulous and I had to substitute dried thyme and garlic powder because I was out of the fresh stuff!